Jax’s due date was November 20. We should be planning his second birthday party right now. Instead, our micropreemie who was born at 23 weeks gestation has been two-years-old for four months. His birthday (July 27) seems like so long ago. We know now, that is not true, especially for micropreemies like Jax. And while Jax is still doing exceptionally well, he’s not totally caught up yet. He has a language delay (although that is improving by the day), he has sensory issues, he suffers from Chronic Lung Disease. The reality of this has hit me hard: prematurity will never be something we can get over. We won’t ever be able to forget how much our journey with prematurity has impacted our lives. November 17 is World Prematurity Day. The day brings awareness of preterm birth and how it effects families around the world. One in eight babies is born prematurely. The more we talk about it, the more we can make a difference! Is prematurity more common in boys than girls? What is Jax’s favorite toy these days? What is your most frequent go-to self-care activity? Self-care – what’s that? Just kidding…kind of. This is something that I have been really struggling with. I have a hard time taking time out just for myself. However, I did start doing pottery again and that has been really fulfilling. I have a couple of hours a week to feel the zen of the pottery wheel and create. It’s been fun, too, to have many of my pieces for sale in a local store and online. Steve says his favorite way to relax is to play the guitar, but he wishes he had more time to do it. Jax loves it when dada plays guitar – he dances around like a maniac and gets so happy! What is the hardest part about raising a child who was premature? For me, the hardest part of raising a micropreemie is always waiting for the other shoe to drop. (My friend calls this crashing waves. Laurie Arnold at The Mighty calls this “continued traumatic stress disorder.”) Statistically speaking, Jax should not be doing this well! I am constantly reminded by doctors and therapists that he is at high risk for issues such as autism, ADHD, sensory integration issues, physical and developmental delays, and learning disabilities. I feel lucky that we are so “plugged in” with professionals who are on the look out for these issues, but sometimes I wish I could bury my head in the sand and forget/ignore all of it. Steve says the hardest part of raising a preemie is all of the surgeries. Having to watch Jax go under anesthesia so many times has been difficult. 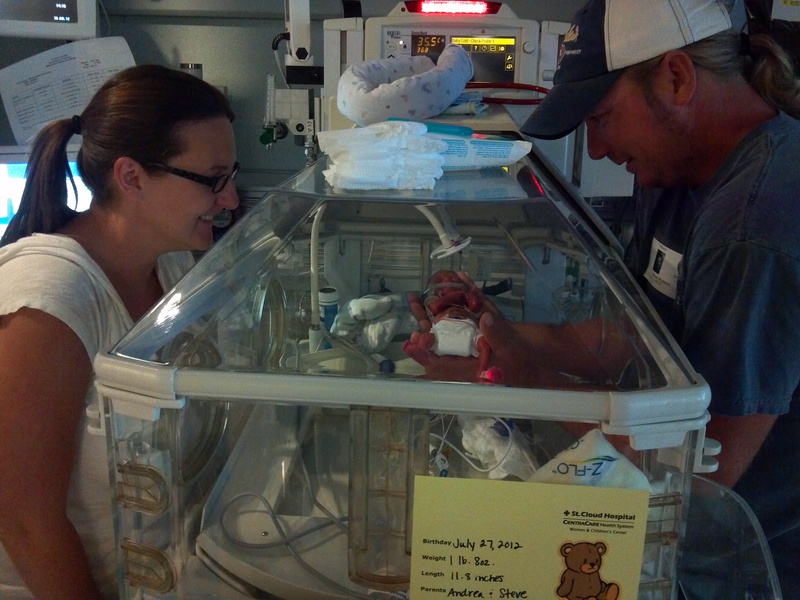 What has been the most surprising thing after discharge from the NICU? For me, the most surprising thing about raising a micropreemie is the friendships I’ve made with other preemie parents. They just seem to get it, especially the parents of other micropreemies. (Here are links to my favorite preemie blogs.) When I started this blog, I expected to keep our family and friends updated about Jax’s journey. It’s become much more than that – I’ve found a connection with other preemie bloggers that I never knew existed. For Steve, the most surprising thing about raising a micropreemie is how fast Jax is growing! We were told that Jax would have trouble gaining weight and growing. In fact, Jax was on a modified, high-calorie formula for his first year of life (after he stopped getting breastmilk in the NICU). Jax also had trouble transitioning to solid foods and showed severe oral aversion to textured foods. Thankfully, Jax eats like a champ now and is gaining weight regularly. He’s in the 87% for weight and the 90% for height! Way to grow, buddy! Thanks for being a part of our story – we appreciate all of your support and love! ❤ If you have more questions, just let us know in the comments!